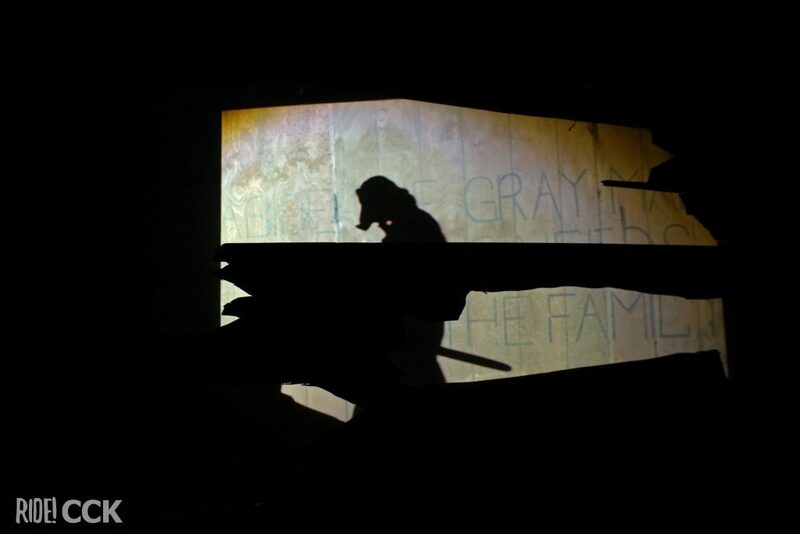 Thus far we have seen how the mazes establish the mood of the event.. Knotts Scary Farm offers many other scare zones, novelties, and shows for added entertainment. Notably, the size of the park makes it almost impossible to avoid the eerie scare zones at Knott’s Scary Farm. This year there are four scare zones, including the new Forsaken Lake, which is right under Silver Bullet. These areas are driven by the scare-actors and work well with dim lighting, fog, and sound effects. Returning this year, are Ghost Town: Streets, The Hollow, and CarnEvil. 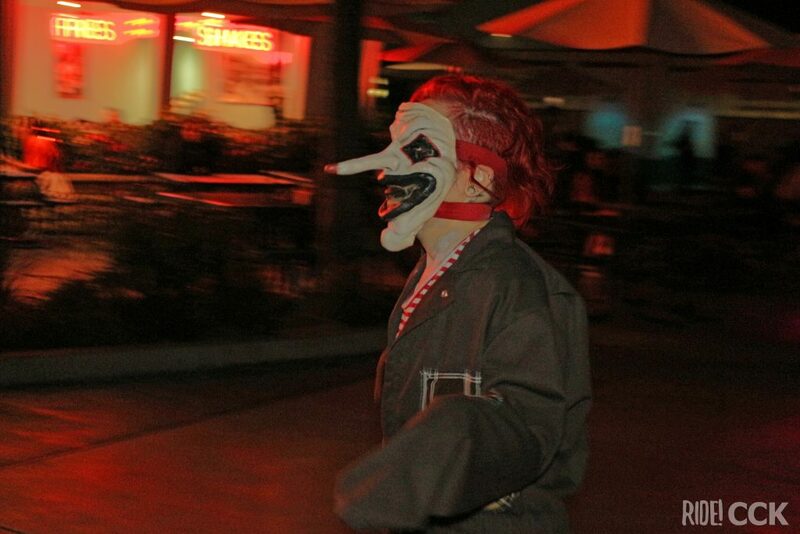 CarnEvil is the largest territory in the park and brings the boardwalk area to life in one of the biggest freak shows. 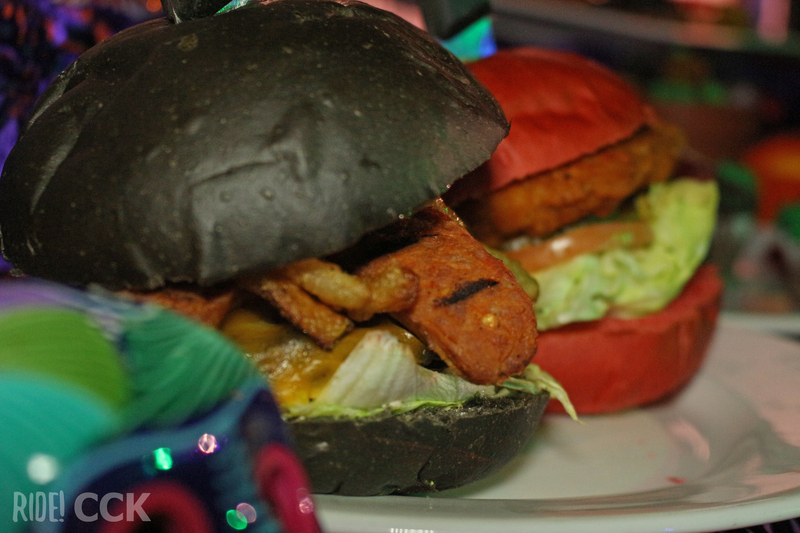 I was extremely surprised by the amount of fun Halloween snacks in the park for the Halloween Haunt. 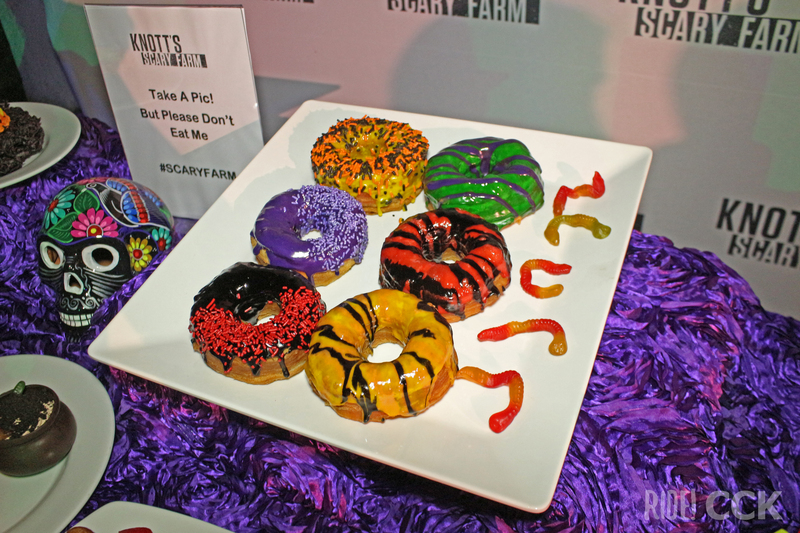 There were plenty of donuts, popcorn, and even burger that were almost to scary to eat. I loved the Inferno Churro and would highly recommend trying some of the amazing seasonal additions to their menu. 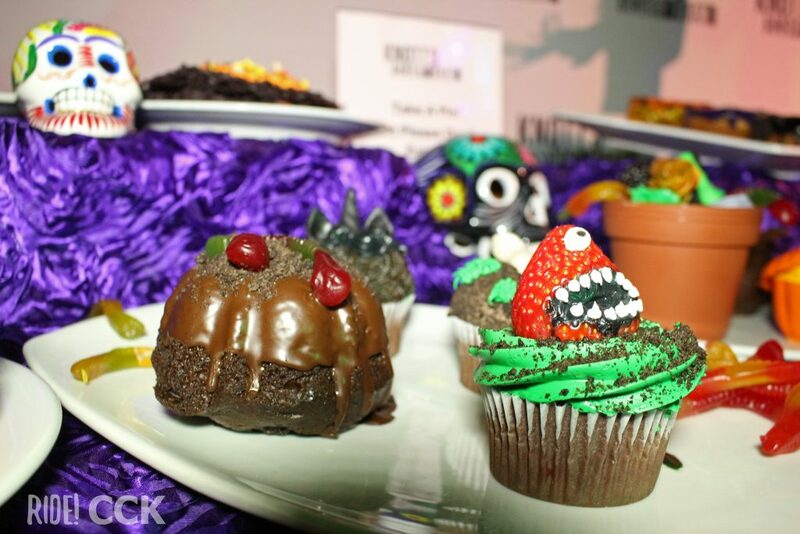 The culinary team truly put their finishing touches on every aspects of these Halloween Goodies. It was a special treat this year that Knott’s had two new shows this year; Conjurers-Magic and Mirth and Hacks! Cutting Room Floor. Conjurers- Magic and Mirth was great because of the special animal co-host. it was everything you want in a hackneyed magic show. Hacks! Cutting Room Floor on the other hand relied heavily on audience participation. Since this show is completely improvised, guest will be able to experience a different plot each time. Hacks! Cutting Room Floor replaces Elvira: Mistress of the Dark from previous years in the Charles M. Schultz theatre for which I will always have soft spot for. This season will be another winner among guest, and we highly suggest checking of the frigh-tivities. 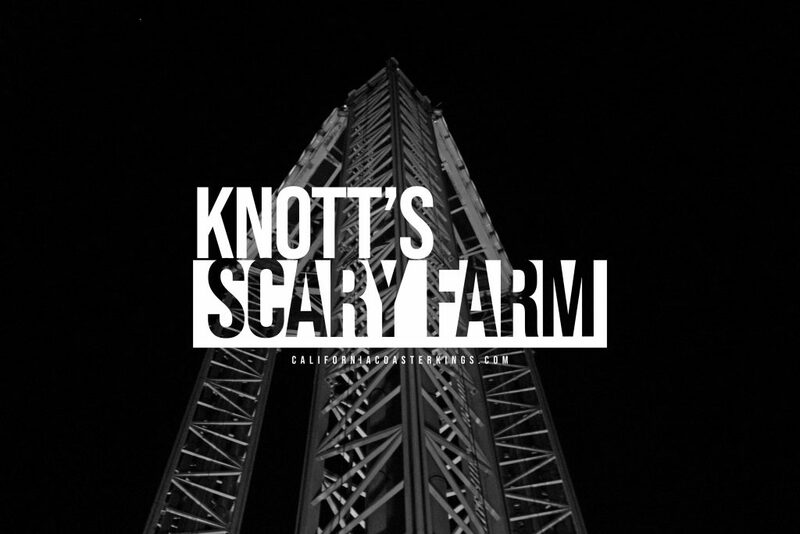 Since the age of 13, I have attended Knott’s Berry Farms haunted event it truly continues to provides one of the highest quality of scares and entertainment to this day. 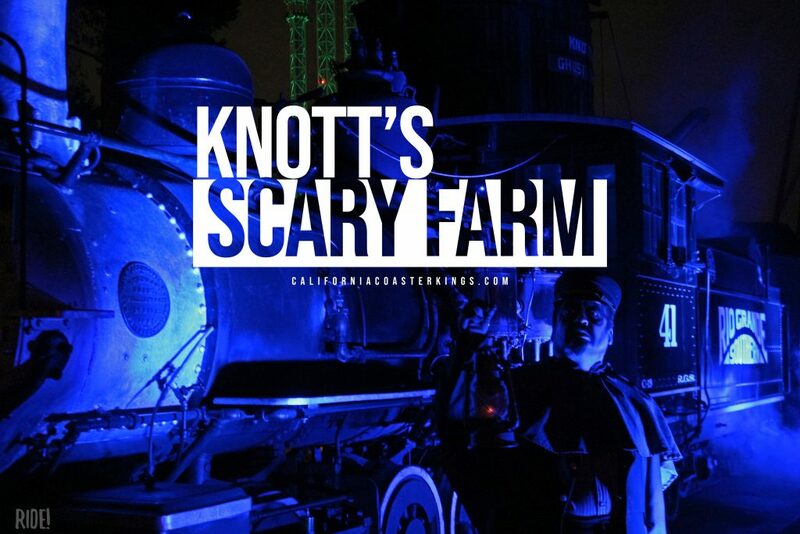 Thank you for checking out this year’s Knott’s Scary Farm Maze Ratings and Reviews. Be sure to check back on our site for more coverage throughout the Halloween Season. Check Out Some of Our Other 2018 Halloween Updates, at Six Flags Magic Mountain’s Fright Fest and Universal Studios Orlando Halloween Horror Nights! Scary Farm disappoints. Family and friends were there for 5 hours and it was so crowded they got to do 2 things. The media is deceived by “media night.” Don’t spend your $, it is not worth the $ and effort to stand in lines all night for so little reward. That’s why you buy the fast pass. If you buy your ticket+fast pass online together it’s $75. The same as if you were to just buy the admission ticket at the booth. With the fast pass you get to the front of the line on all mazes and rides. Of course Knotts scary farm is packed-because it’s awesome. If you don’t want to spend the extra $30-$40 for that then keep your negative a** at home. I agree Lisa!! I brought my 14 & 16 year old nephews to the park for Halloween Haunt and it was one of the worst experiences ever!! We had a fast pass but you still were waiting in line for over an hour to enter a ride or maze. However, the lines were not my issue as I know that comes with going to any amusement park…the problem was the huge and dangerous crowds. In the attempt to get my family out of the park, we encountered 4-5 fights. The crowd was like a stampede and there is no crowd control. At one point we had to jump a fence to get away from the massive group of teen-agers trying to run to a fight! The capacity limit for Scary Farm should be less than the capacity when the park is open for the day. It can be a very dangerous place with the enormous crowds and mobs of people trying to witness or phone film the fight. The cops and park security understand the chaos that is happening. Crowd capacity and maybe adding an age limit for Scary Farm, will help! along with better security check at the entrance. If it hasn’t happened already, there will be a shooting or multiple people w injuries for the park to change their policy in controlling the number of people entering the park. Unfortunately, when the entrance price is low as it is, it allows riff-raff, gang-banging, teen-aged rejects the ability to enter Scary Farm making it a place where no parent would want to bring their family for the Halloween holiday. Agree with comments. Fright lane / Fast lane is a good deal, and it cuts the wait all together. The placed is packed as are other popular haunted such as Universal, because they are so well done. If you don’t want to wait, pay the extra. Its well worth it! We finished all mazes in less than an hour and a half, then went again, sat and ate, went on rides, and still got out of there in 4 hours total. This year as always, DID NOT DISAPPOINT! Best 3 haunted attractiins: Knotts, Universal, Warner Bros. All amazing, all a little different experience and how its presented. @Cynthia. Again, all the top haunted attachments are packed. You just gotta expect the crowd. If you want fun Halloween, easy going, no city type crowd, Disneyland is your best bet. Not sure the 14&16 year would choose that over Knott’s, but worth trying. They still reign supreme for family, clean, fun atmosphere … they can afford it. As for waits with the fast lane, for mazes there literally was none. We went on one of the most popular nights, last weekend in October, and while the new Depths maze was over 3 hour wait (3 1/2), we waited less than 5 minutes on the clock. Everything else was straight in, literally, and while the lines were 1 1/12 – 3 1/2 (for one of the new ones), each, it took us 1 1/2 hours for all 9 attractions, and that’s because we had to walk around and get there, plus the time it took to walk through. I literally clocked it. Couldn’t get any better. Also went to Universal, far more expense, and was similar, though it was a little waiting to get through with express (anywhere from 5-15 minutes), and it took a long time to walk to places, including the tram experience which has you get off and walk quite a ways in a huge crowd. I’d have to say, if you are going to an event that involves “recommended over 13”, scary, horror themes and experiences, you are definitely going to have a rowdier, more mature, and teenage crowd. Its expected. Its not really billed as a “family event”, though many family enjoy such things together. Again, family fun you expect as a family night, easy going, but fun experience… Disney. We’ve been to all the major parks, and Disney is obvious the “family friendly, expected” event. Cost is major though. Unless you buy tickets for Mickeys Halloween Party which is for 7 -12 only (with 3 hours earlier entrance), and 1 park only (parking not included anymore). If you plan accordingly for the type of event, you’ll have a much better experience wherever it is. Next PostNext Infinity Falls at SeaWorld Orlando Review!